In this latest segment of Random Thoughts from the Humidor, I ponder cigar names, electronic smoking devices, and cigar sponsorships. I’ve been critical of the names some cigar makers choose for their sticks, so it seems only right that I offer some praise for what seems to me to be a good trend: fewer and fewer with Cuban roots. It’s easy to see why, after Cuba nationalized the cigar industry in the ’60s, former owners who fled wanted to keep their brand names for new operations elsewhere. But others seem to have simply adopted Cuban brand names simply to cash in on the association with Cuban cigars. In recent years, though, the trend seems to have slowed considerably. Perhaps it’s partly the influence of numerous successful cigar makers without a Cuban background, such as Rocky Patel. Perhaps it’s part of the industry’s natural growing process. Or maybe they’re finally just running out of good Cuban names. Whatever the reason, I think it’s a good trend, one I’m happy to see continue. Occasionally, I hear from an electronic cigarette manufacturer introducing a new product, asking if I want a sample to review, or simply extolling the virtues of vaping. Frankly, I can’t think of anything much more misguided than e-cig makers trying to appeal to smokers of premium cigars. E-cigs, like conventional cigarettes, are simply nicotine delivery systems. Premium cigars aren’t. It’s as simple as that. I have nothing against e-cigs. I hope the industry grows and prospers. 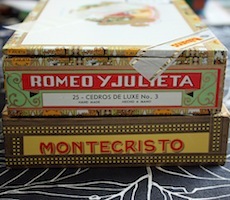 But I also hope they learn a little bit more about cigars, and what makes cigar enthusiasts tick. I’m pleased to see the Orange Bowl debacle didn’t discourage cigar companies from sports sponsorships, both charitable and commercial. Among the latest is General Cigar, which is sponsoring the Golf Channel program Big Break Mexico. And Arturo Fuente and J.C. Newman were among those involved in a benefit for a local Tampa little league. I too find it more appealing when manufacturers release blends with unique names, not just recycle old Cuban trademarks. Especially from these white guys that have no connections to Cuba whatsoever. I thought "Crowned Heads" was a cool name, for example. Agreed. Crowned Heads has done a fine job with branding. We'll know non-Cuban manufacturers have arrived when we stop seeing so many bands duplicating those on the Partagas Serie D.
Love the 7th anniversary contest….